Most Art Boutique Hostel located in a privileged area, the concept of Most Art Hostel is to present our guests the opportunity of living cultural and social experiences, as sharing they adventures and stories. 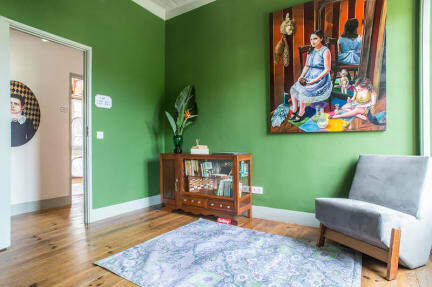 Besides the usual concept of accommodation, the Most Art Hostel has the peculiarity of encouraging art and culture, keeping in mind present artworks of different artists from around the world, with primarily focus on local artists. We are located next to the Museu De Leiria, the Museu Moinho de Papel and the Rio Liz goes right in the front yard. A 5 minute walk from the of the city and 10 minutes from Leiria Castle. Leiria is just 1 hour drive from Lisbon, 1 hour and thirty of Porto. The 40 minutes of Fatima and 15 minutes of Batalha. For surfing we are 1 hour from Supertubos beach and 30 minutes from the Giant Wave in Nazare. Check in from 14:00 to 23:30 . 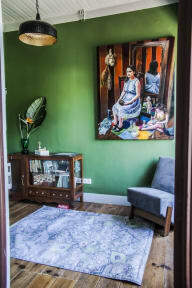 The reception of the Most Art Boutique Hostel is open from 08:00 until 22:00 . Very recommended for children and families. We have free access to people with reduced mobility. Very helpful girl Sandra at the door was welcoming and checked out my slightly awkward onward connections. I thought there might be a pc for internet access, but this was not a major issue. Spick and span, with quirky - if a bit scary - artworks. End of Jan wasn't the time for atmosphere, and I was out on the town anyway, making music with students in gowns & mandolins, so I've given the benefit of the doubt on that score. Good location just on the edge of town, a nice walk along the river. We were here in January with subfreezing temps at night. Much of Portugal is ill equipped for it. It was very hard to keep our room warm enough, but they seem to be working on it. Only one women's shower had privacy, and it had a strong chemical smell. Breakfast was substantial and they accommodated us with an 8 am breakfast when we need it. This is a new hostel. Beds were excellent, but no curtains. Bunks were three high. The top about 2.5 meters above the floor no place to store glasses etc. We did not know the parking was public and would close at 10pm, because we arrived pretty late. However, we had no fuss checking in after finding some parking space in the small lane behind. Breakfast served pretty late, we could not wait for it and even at 8:00AM, the morning shift staff did not come in so we could not even grab something quick to go. Maybe it was the heavy rain that morning, but it would have been nice to have something before leaving town. Nothing like what was pictured on Hostelworld - there was no art here, none at all. We were told on arrival at 2pm that check-in was at 4pm, despite Hostelworld confirmation check-in was 2pm. When I said I would let Hostelworld know their information was incorrect, we were allowed to check in at 2pm! Room was so small, unable to open luggage. Shared bathroom on 1st floor had no lock, only a shower curtain, so no privacy to wash and was not very clean. Timer taps, lasting 20 seconds.